Nestlé India has managed to grow volume sales in all its product categories in 2017. While the company has grown its sales over the past few years, except in 2015, an all-round growth has come after years. As per the annual report of the country’s largest pure-play food and beverages company by revenue, during the calendar year 2017, four big product categories - milk products and nutrition, prepared dishes and cooking aids, powder and liquid beverages and confectionary - grew by volume. According to Suresh Narayanan, chairman and managing director, Nestlé India, being nimble footed, keenly responsive and embracing opportunities will be crucial for the firm. “2018 is going to be about bringing consumers closer by being responsible, transparent and focusing on sustaining long-term relationships that add value” he said. Milk products and nutrition, the largest category that contributes nearly 47.6 per cent to the company’s top line, grew 1.6 per cent. Since 2012, the category has grown in value terms with a dip in 2016. But volume growth remained missing with uptake declining by 1.1 per cent to 5.4 per cent every year. Prepared dishes and cooking aids, primarily represented by brand Maggi, has been the only growing category for the company for years. In 2015, however, its sales plummeted after several bans were levied on its sale for containing monosodium glutamate and lead in beyond permissible quantities. However, after a swift comeback in late 2015, the category grew by 71.5 per cent in 2016 and its growth rate stood at 19 per cent in 2017. Its current contribution at 26.7 per cent, though, is yet to match the pre-Maggi ban level of 31 per cent. Powder and liquid beverages, which contribute 13.7 per cent to the top line, grew 10.6 per cent. This comes after volume uptake shrunk by over 10 per cent each in 2014 and 2015. Uptake in its smallest category - confectionary - too improved as volumes grew by 4.3 per cent. 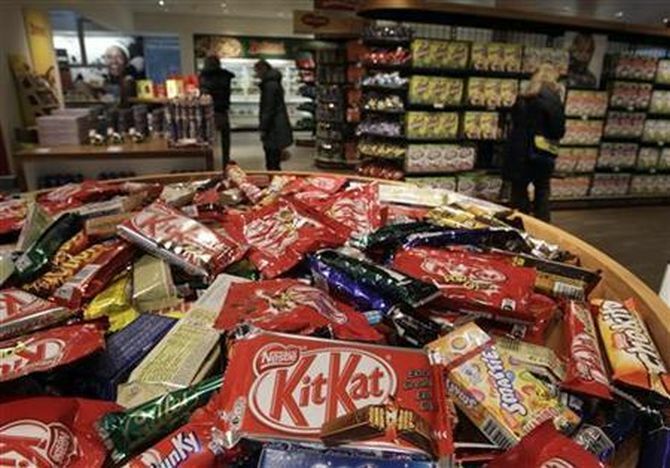 According to analysts, the turnaround in Nestlé’s volume sales is a result of the initiatives taken in the past two years. After faltering on sales front in 2015, Nestlé considerably expanded its portfolio across categories and reduced its dependence on Maggi. During 2016, the company launched over two dozen products under milk and nutrition, confectionary and beverages portfolio, apart from expanding its Maggi noodles variants. In 2017, its shifted focus on rebuilding its brand, highlighting the safety aspect. Apart from fortifying a range of products, including Maggi, with iron, vitamins and minerals like calcium and iodine, it has significantly cut down on usage of salt and sugar in line with the stated objective of offering healthier choices. The company has set a target of reducing salt by 10 per cent per serving and usage of sugar by 700 tonnes per year till 2020. According to Abneesh Roy, senior vice-president of Edelweiss Securities, Nestlé’s supply-chain actively worked towards enabling consumer-led growth.